Shouldn’t have to say it, but will anyway. There is obviously some very strong language here. You’d be using it, too, so get over it. Just don’t watch it at work. In all, three Taliban fighters were killed and American forces didn’t suffer any casualties. I saw the first guy shoulder his RPG, take a knee, and point it directly at me from about 15 meters away. I’m not sure if it was luck, but I shot first and hit him twice. The rest of the team engaged immediately after. At the end of the day there were no friendly casualties, and we had eliminated 3 Taliban fighters. This footage has been edited to exclude the close up graphic footage of the enemy KIA. This footage is part of an ongoing documentary of the war in Afghanistan from the soldiers’ point of view. Mad World News GoPro Captures Tense Moment U.S. Soldiers Ambushed by Taliban in Afghanistan. On July 18, 2009, the Taliban released a video showing the captured Bergdahl. In the video, Bergdahl appeared downcast and frightened. A Department of Defense statement issued on July 19 confirmed that Bergdahl was declared “missing/whereabouts unknown” on July 1, and his status was changed to “missing/captured” on July 3. In the 28-minute video his captors held up his dog tags to establish that the captured man was Bergdahl. Bergdahl gave the date as July 14 and mentioned an attack that occurred that day. According to the Associated Press, General Nabi Mullakheil of the Afghan National Police said the capture occurred in Paktika Province. Their other sources inform them that he was captured by a Taliban group led by Maulvi Sangin, who has moved him to Ghazni Province. The Guardian quoted sources who speculated about the increased difficulty of a rescue mission if Bergdahl had been smuggled across the nearby border into Pakistan. CNN described two Pashto-language leaflets the U.S. military was distributing in seeking Bergdahl. One showed a smiling GI shaking hands with Afghan children, with a caption that called him a guest in Afghanistan. The other showed a door being broken down, and threatened that those holding Bergdahl would be hunted down. In December 2009, five months after Bergdahl’s disappearance, the media arm of the Afghan Taliban announced the release of a new video of “a U.S. soldier captured in Afghanistan”, titled “One of Their People Testified”. In the announcement the Taliban did not name the American, but the only U.S. soldier known to be in captivity is Bergdahl. U.S. military officials have been searching for Bergdahl, but it is not publicly known whether he is even being held in Afghanistan or in neighboring Pakistan, an area off-limits to U.S. forces based in Afghanistan. On December 25, another video was released that shows Bergdahl in a combat uniform and helmet. He described his place of birth, deployment to Afghanistan and subsequent capture. He then made several statements regarding his humane treatment by his captors, contrasting this to the abuses suffered by insurgents in prisons. He finished by saying that America should not be in Afghanistan and that its presence there is just another Vietnam. On April 7, 2010, the Taliban released a third video of Bergdahl, now with a full head of hair and a beard, pleading for the release of Afghan prisoners held at Guantanamo and Bagram. In November 2010, Bergdahl appeared briefly in a fourth video. In May 2011, Bergdahl appeared briefly in a fifth video. In December 2011, it was reported that Bergdahl tried to escape three months earlier but was recaptured after three days. In June 2013, Bergdahl’s parents received a letter from him through the Red Cross. 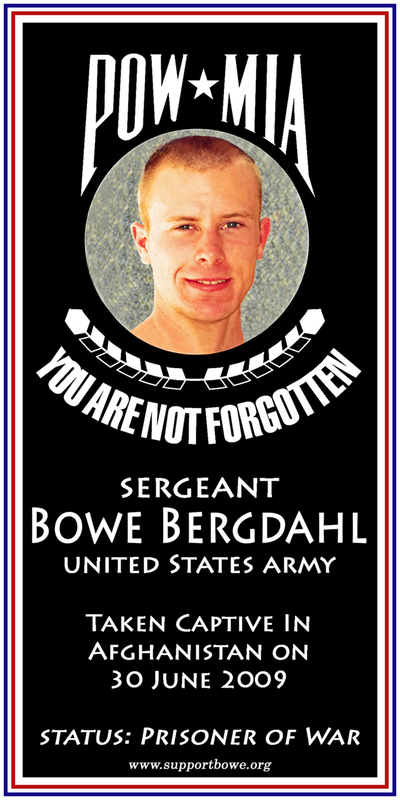 via Bowe Bergdahl – Wikipedia, the free encyclopedia. America is Waiting for You! We don’t leave anyone behind. Bowe has been a POW for far too long. Click the links above to learn more about him and how to help, then start writing your reps for answers. Contact your local media as well. Let’s bring Bowe home NOW!